Ms. O’Neil is a program manager for Pacific Northwest National Laboratory, stewarding the US DOE EERE Renewable Energy portfolio. Her research efforts at the Laboratory include marine energy deployment, energy storage regulatory analysis, sustainable hydropower, variable energy integration, market design, and renewable energy policy. Ms. O’Neil joined the laboratory after working for over five years at the Oregon Department of Energy, where she administered the Renewable Portfolio Standard, operated several large programmatic federal grants for energy efficiency and renewable energy activities across the state, administered a renewable energy feasibility grant program, and served as the Department’s expert on water power. 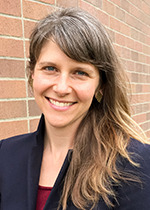 Before her state service, she managed the multifamily energy efficiency program for a contractor of Energy Trust of Oregon and represented a coalition of river conservation and recreation organizations in federal hydropower dam licensing. She serves on multiple organizational boards and advisory groups related to renewable energy.